The following is part of an article I wrote for Bird Observer published Volume 43, Number 1, February 2015. Plymouth Long Beach historically has been one of Massachusetts’ largest Common Tern colonies along with nesting Least Terns plus many pairs of Piping Plovers and in recent years the numbers of Laughing Gulls has exploded. It is also an interesting crossroads of sorts for Arctic Terns and Black Skimmer. 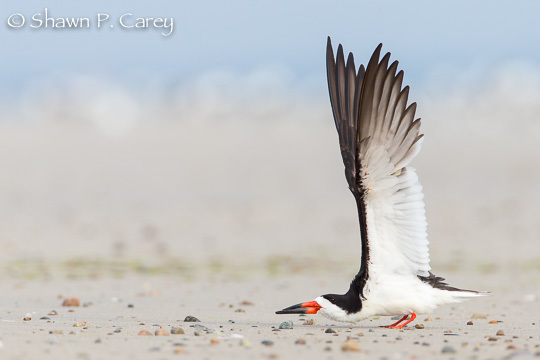 Plymouth Beach is the southern most location for nesting Arctic Terns and the northern most for Black Skimmer. However in most years there might be one or maybe two pair of Arctic Terns and I am not aware of them nesting there in the past two years. As for Skimmers records show at least one pair attempting to nest there in recent history going back to 2009. That year I documented with photos Skimmers on a nest August 1, 2009. I returned August 7 and 8 to find the Skimmers still sitting on their nest. Returned the following day August 9, 2009 and documented one Skimmer chick. By all accounts it was late in the season for nesting but they did at least hatch one chick and now time would tell if this would be a feel good story. Sadly any good news would vanish in less then one week the chick was gone and likely taken by a predator. Over the next three years (2010, 2011 and 2012) to my knowledge Skimmers did not attempt to nest on Plymouth Beach. They were observed in the area each of those years however I saw no signs of nesting. That all changed when a pair of Skimmers arrived in July 2013 and very quickly looked like they were determined to nest. However it was not until about August 3 that I documented this lone pair of Skimmer on a nest. The bad news was they had in my opinion picked a bad location for their nest, which was very exposed on a section of beach just south of where the tern colony was located. To make matters even worse by nesting so late in the season the Skimmers would be the last of any of the nesting birds on the beach. It did not look good for a successful hatching let alone fledging. I returned on August 25 and much to my surprise there were two Skimmer chicks about a week old and appeared to be healthy with both parents very attentive to their young. This was a good sign but still a long way to go before these two would fledge. I returned again August 31 with friend and fellow photographer Christopher Ciccone and quickly located both adults and chicks all looking good and making progress on their development. However a week later Christopher and I returned on September 7th to find only one chick and while it looked to be healthy and both adults keeping a close eye on their little prize possession the odds now seemed to be stacked against this remaining chick. Within a week of that visit I received word that the lone skimmer chick had gone missing and was likely taken by a predator. 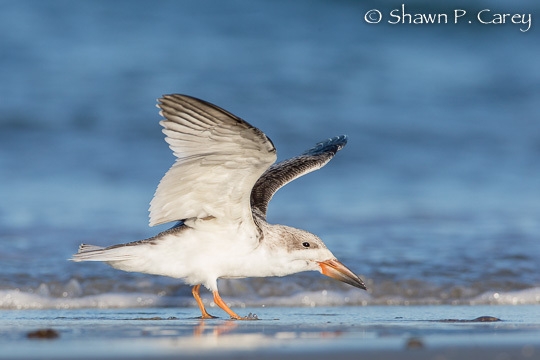 Alas another failed year for Skimmers and their chance to fledge young from Plymouth Beach. If these two adult Skimmers were going to be successful raising their young on this beach they were going to have to do a better job the following year. That would begin with nesting earlier and in a more suitable location but I would have to wait until 2014 to see how this would play out. My first visit to Plymouth Beach for the 2014 summer nesting season was Saturday June 28 and my expectations were high with reports I had read on MassBird of a pair of Skimmers observed on the beach for over two weeks. When I arrived in the area of the Common Tern colony I searched for almost one hour I could not find any signs of Skimmers on Plymouth Beach. Had they already given up this early in the season? I would have my answer soon and it was all good news. The reason I could not locate the Skimmers was this year they had done something that would pay off in a way that would increase the odds of a successful nesting and hatching. Fledging was still a long was away but what they had done this year was to nest in with the Terns and did so just over a top side of a sand dune which appeared to provide some protection. Would this be a difference maker? Only time would tell but at least they had done a better job from the start this year. I would not return again until July 26 about a month since my last visit and quickly found the adult Skimmers and hundreds of Common Terns including many that had fledged but no sign of Skimmer chicks. Both adults were there and clearly to me seemed to be spending time on the other side of this sand dune where I had observed them a month earlier. I would take this as a good sign and returned a week later (August 9) to find two very healthy Skimmer chicks that looked to be much older then I expected. So my guess is when I was there a week earlier the parents must have been feeding the chicks up in the dunes where they had nested. However that was not the only interesting observation that day for this family of Skimmers. If any other birds in the area of the Skimmers chicks got to close to them the adults would quickly run them off. This included Laughing Gulls, Common Terns and any Herring Gulls that were flying by. That was true for all but one adult Common Tern, which over the three hours I spent with the Skimmers was rarely more then ten or twenty feet from the chicks. I was back again on the morning of August 10th and spent another three plus hours observing the same behavior as the day before. This lone adult Common Tern staying very near these two Skimmer chicks and when the adult Skimmers would fly off for long periods of time the Tern was still there as if it was babysitting them. Then something unexpected happened, the Common Tern flew off and when it returned it landed near one of the Skimmer chicks with a small fish. The Common Tern walked towards the Skimmer chick and the chick moved towards the tern as if it were going to take the fish. At the last second the chick moved away from the tern and the tern ate the fish. But what I had just witnessed was to say the least shocking. Was this Common Tern or “babysitter” actually feeding these Skimmer chicks? I would have to wait another week to get the answer. On August 17 I along with good friend and fellow photographer Dr Karl Zuzarte returned to Plymouth Beach and after two hours Karl had photographed the adult Common Tern feeding one of the Skimmer chicks which by now were able to fly a very short distance but any real flight was a few days away at best. WOW! Could this really be happening? Skimmers would successfully raise and fledge two young from Plymouth Beach and with the help of a Common Tern that had seemingly adopted these two chicks. Remember the adult Skimmers would still not tolerate any other birds near their young, except this one Common Tern. I retuned again August 26 and for over an hour I could not locate a single Skimmer anywhere on the beach at low tide. But just as I was making my way back to my vehicle I spotted all four Skimmers looking safe and resting along the shore and right there with them was guess who…the Common Tern. This by now was the only Common Tern anywhere on Plymouth Beach! I returned again on August 30, 31 and Labor Day September 1st and each day photographed all four Skimmers and the “Babysitter”. By now the young Skimmers were spending time flying along the shore practicing skimming and being taught by their parents how to be a “Skimmer”. On September 1st there was even a long period when one of the young Skimmers was nowhere to be found for over three hours. When it returned the Common Tern flew in and landed right next to the young Skimmer with a fish, luckily I was able to capture the moment. This turned out to be one of the last photos I took of this group but have hundreds of other photos and many minutes of video documenting these Skimmers amazing journey. I did not returned after September1st however I feel pretty good about this family of Black Skimmers and their success this year. Maybe it just took a little help from a friend. Click on any of the photos in this article or this link to see a video showing the progress of this Skimmer family in 2014. To view photo gallery clink on this link. Note the 2015 nesting season of both Common Terns and Laughing Gulls did not take place on Plymouth Beach. While I do not know all the reasons why the colony abandoned I suspect the increase number of nesting Herring Gulls may have been the major cause. 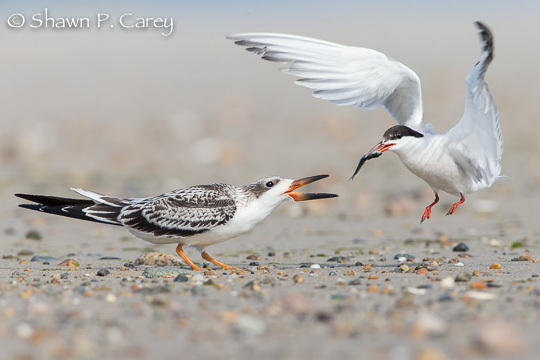 However Least Terns, Piping Plovers, Willets and even Killdeer all fledged young in 2015. Remember please help to protect wildlife and wild places. Thanks for sharing this interesting story and beautiful photos Shawn. Wow, what a great story. Thanks for sharing it.